Palo Alto University (PAU) seeks to serve the mental health community by empowering students, faculty, and staff to engage minds and improve minds in their local and global communities. 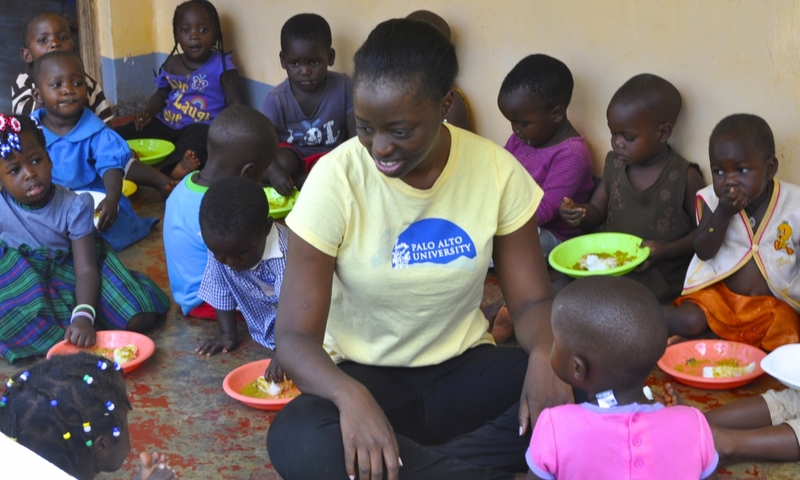 Granica Faith Nansembe at the John and Faith Children’s Resource Center. Kahanaaloha Kuikahi-Duncan, a student in the Ph.D. Clinical Psychology doctoral program recipient of the Native Hawaiian Health Scholarship Program, a service-oriented scholarship program for scholars of Native Hawaiian descent being educated in the healthcare field. Tara Linnea Weldon, Ph.D. Clinical Psychology student received the Honorable Mention Poster Award at the Western Psychological Association in Portland, Oregon this year. Her poster titled “Genocide in Cambodia and Intergenerational Attribution of Blame” was among a vast group of competitive posters. Grancia Faith Nansembe, has used her education and her passion to help others to create a non-profit children’s center in Uganda. The John and Faith Children’s Resource Center (JFCRC) is a safe haven for the young children of Uganda. Instead of roaming the streets and getting into trouble, the two acre Center gives these children a place to play, eat, learn, and receive medical attention. The Gronowski Center is a psychology training clinic dedicated to providing compassionate counseling, psychotherapy and assessment services to adults, older adults, couples, adolescents, children and families in Santa Clara County and San Mateo County. The clinic offers services on a sliding scale basis as a part of its community mission. i4Health is focused on closing the gaps in global disparities in mental health resources. Due to geographic and economic obstacles, most people around the world do not have proper access to health or mental health services. The i4Health team is committed to developing, testing, and making available to the public behavioral and mental health interventions that can be used repeatedly by anyone who needs them around the world. The Gender and Youth Program (GYP) is designed to support transgender and gender non-conforming youth both mentally and emotionally. The program develops, evaluates, and disseminates interventions that reduce psychological distress and increase resilience among transgender and gender-nonconforming youth. There are many opportunities to support Palo Alto University (PAU)-led efforts that are continually making a positive impact locally and globally. There are several projects, centers, and programs in which individuals can direct your gift to PAU. To learn more and give, please visit the Institutional Advancement page.